We have Christmas four packs of @lochnessbrewery beer availiable exclusively through the @cairngormbrew shop! We’re cheering on Highland RFC at Canal Park, Inverness! It has been a fantastic 2018/19 season so far, and Loch Ness Brewery is proud to be involved as shirt sponsor. You can purchase a jersey for yourself from the Highland RFC online shop. 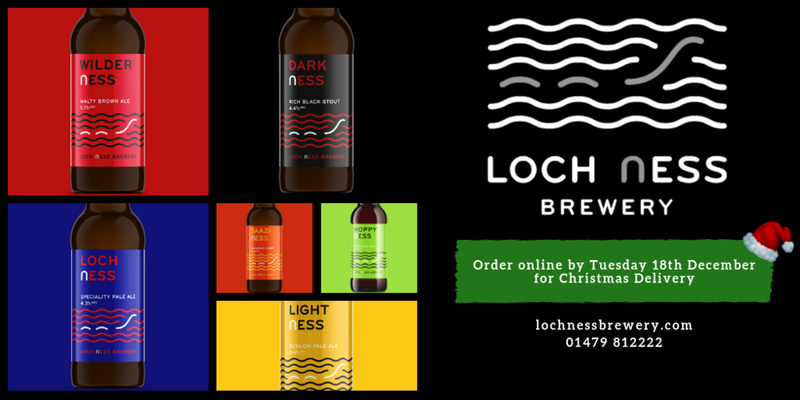 You can now purchase Loch Ness Brewery merchandise through the Cairngorm Brewery website. Congratulations to our Managing Director, Samantha Faircliff, awarded Ambassador of the Year at the 2018 Highlands & Islands Food & Drink Awards! Loch Ness Brewery & Cairngorm Brewery were represented at IMBIBE 2018 on The Brewers’ Association of Scotland (TBAS) stand. International Business Graduate, Calum MacLeod, was on hand for trade enquires and to talk through the Loch Ness extended range. We're excited to link up with Highland RFC for the upcoming season - Loch Ness Brewery has become the back-of-shirt sponsor for the team, and will be cheering them on throughout 2018/19 at Canal Park, Inverness! Thank you to everyone who came to visit us on the Scotland Stand, 2030a, for Speciality Fine Food Fair 2018! Our Sales Director, Merlin Sandbach, and Sales Executive, Marc Lyell, were on hand to talk through our extended range - for passionate beer drinkers and trade enquiries.